While Duolingo isn’t a perfect app, it is one of the best ones out there for learning a language because it's flexible for both the casual, and the intensive, language learner. Duolingo is laid out like a game and has a visually appealing interface. The game is set up as a tree that you must slowly work through. When you get to the end, you’ll get a cute little trophy wearing a flag that represents the language you’re learning. Each node in the tree consists of several lessons. Each lesson is a level that you must beat by answering questions until the bar fills up, with correct answers bringing the bar up and incorrect ones bringing it down (~17 questions if you don’t get any wrong). The types of questions include free translation, putting together a translation with a set of given words, speaking exercises, listening transcription, and picture matching. When you complete a node, it will turn golden and you will receive some number of the game’s currency-- “lingots”, which can be used to purchase various bonuses such as costumes for Duo the owl (the game’s mascot), bonus lessons (like Flirting and Idioms), and other fun things. The next row in the tree will also open up for you to do further lessons. Like Rosetta Stone, Duolingo will not teach you grammar lessons, which can be fun if you like to figure out the grammar of the language through a puzzle, or frustrating if you just can’t figure out how something works. Luckily, if that’s the case, you can go on the website to see mini-grammar lessons for each node or just check online for the specific issue you’re looking for: For example, Duolingo Spanish has a lesson on the two verbs meaning “to be”--ser and estar. You can read about the difference in the lesson on the website or just search “What is the difference between ser and estar?” on Google. Now that I’ve described the mechanics of the game, let’s move on to the actual pros and cons. This con is minor since you shouldn’t be depending on an app to get you to a natural speaking level with humans. However, note that the speech recognition task can be frustrating. Sometimes you might say nothing at all or not even complete your sentence and the device will mark you correct. But often, you will be saying a sentence close to how it sounds and the game will keep telling you that you’re not saying it right. If this happens often, just turn the speaking exercise off, because the speech recognition tool doesn’t actually give any real feedback. What you should do is repeat every sentence out loud to yourself for the tasks that give you audio and depend on native speakers to let you know how good your pronunciation is. 2. Keeping up with constantly decaying skills can feel discouraging. The game has an algorithm that decays each skill over time. Each time you strengthen the skill, the time before it decays again will increase. So for example, if your skill decays after 1 day, once you refresh it, it might decay again after 2 days. When you first learn a lesson, it can be easy to forget what you learned, so this is very useful at first to solidify the vocabulary and grammar you have learned. As the lessons pile on, though, you might be very discouraged to see a bunch of your skills dropping over the course of 24 hours. My suggestion is to be diligent at refreshing skills after you first learn a lesson until you feel comfortable with the words and have no problem recalling them without help. Once you reach that stage though, it’s best to not be a perfectionist because you will just be discouraged to see your skills constantly falling. Instead, take advantage of the “Strengthen Skills” button, since it will choose your weakest words and grammar points to improve. Do it at least a few times a day to keep your memory working! You will run into a lot of useless or bizarre sentences in the game whose sole point is to illustrate the usage of a grammar point or vocabulary item. Don’t take Duolingo to be an exemplar of natural language, but rather to be a tool to give you the skills to understand the usage of vocabulary (especially for grammar). Don’t be thrown off by weird sentences like the one above. This is the most important thing to remember about Duolingo. It will not get you to fluency, but it will get you to a basic level where you should be able to have various grammatical constructions at the back of your mind to construct simple sentences. 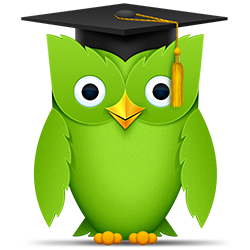 Your reading level should be fairly decent since Duolingo provides a variety of grammar and vocabulary, but if you are learning a foreign language to proficiency, you should supplement Duolingo with a language course or practice with a native speaker. That being said, Duolingo is great for providing you with the basic tools to communicate and to keep you using the language every day. If you like simple games, Duolingo will be great! The simplicity of the game and its visual appeal will keep you going. As you get comfortable in the language you’ll find your fingers moving more speedily and you’ll be able to recall sentences in your mind quickly. This in turn will make you finish levels faster. Duolingo also keeps track of how many days in a row you have played it, so keeping up your streak is great motivation to practice every day! If you live in an area where you walk a lot or take public transportation Duolingo is perfect. You’ll feel productive on your commute and it can take the place of playing a mind-numbing game like Candy Crush! Each lesson takes 5-10 minutes so it’s not a huge commitment to play a few levels. As of writing this blog post, Duolingo offers Spanish, French, Italian, Portuguese, German, Dutch, Swedish, Norwegian, Danish, Irish, Ukranian, Turkish, and Esperanto and there are several other languages in the works, all through user-voluntary contributions. So Duolingo is the polyglot’s dream and it continues to improve thanks to user feedback. If you get a question wrong but are pretty positive that it was correct, you can report it and it will be checked on quickly. The quick updates mean that Duolingo is constantly improving, which will keep you entertained and motivated. This fact is very important--many language classes unfortunately focus on rote memorization of words, which is not only unnatural, but also tedious and ineffective in long-term memory storage. Because Duolingo presents everything in context, you will get used to using the vocabulary words and grammar points in a variety of constructions. With the help of a language class or a native speaker, the things you learn in Duolingo will eventually come more naturally to you than they would if you learned them in isolation. As I emphasized before, Duolingo does not stand alone. If you want to just learn basics of a language and dabble casually, Duolingo is completely fine on its own. If you’re determined to master a language though, you should only use Duolingo to get you started and take an actual language program or practice with a native speaker to bring you the rest of the way. Duolingo is meant to be a fun app. That’s why you have Duo the owl cheering you along the whole way! It turns your language learning experience into a game where you’re trying to beat levels so think of it as no different from playing 2048 or Bubble Witch Saga and you’ll have a better time! Each level is very short, so it’s not hard to play just even one or two levels a day. Of course, it’s more rewarding the more you can play per day, but even at a casual pace you should be able to learn gradually. The website version has a more useful layout, so if you’re feeling more committed, you can use it instead of your smartphone’s app (also useful if you don’t have a smartphone). It even has progress exams where you can test how much you’ve learned of your target language. Just like exercise, a little a day goes a long way. It can be discouraging if you keep getting things wrong but that’s what language learning is about--making mistakes! The more you refresh your skills, the more you’ll remember and sooner than later you’ll be able to complete a level perfectly. It can also be discouraging to see a lot of your golden nodes decay to normal colors all of a sudden, but think of the decay as reminders to practice and not as going backwards in language learning. Language learning isn’t about perfection but about practice! Particularly for the intensive language learner, the website offers forums where people can meet to practice their target language and long text translation exercises for those who want to improve reading and writing. Because the app is portable, it is very easy to keep up each day on your commute to work or school and back. You’ll be surprised by how much progress you can make over a year just through casual playing! For both the casual polyglot who hopes to dabble in various languages and the language learner who wants to get a grounding for later practice in a class or with a native speaker, I strongly recommend Duolingo as your app of choice. For more relevant reading, check out these other blog posts, written by our language tutors: Everyday Immersion, What Is Linguistics?, Mastering the Perfect Tense. Looking to work with Tyler Lau? Feel free to get in touch! Cambridge Coaching offers private in-person tutoring in New York City and Boston, and online tutoring around the world.